The rear is much easier than the front, thank god! Start by removing the shocks, swaybar, lower trackbar bolt (not the upper as shown in this photo) and pop the springs out of there. You won’t need the spring compressor on this end. You can then start removing the stock arms and replacing them with the new adjustable Rubicon Express arms. You’ll also need to get them adjusted properly and exactly the same. The uppers need to be 14 3/4″ center to center and the lowers needed to be 17 1/2″ center to center. Get this all taken care of before you start installing them as you want to have them side by side to make sure they are the same. Snafu number 1. 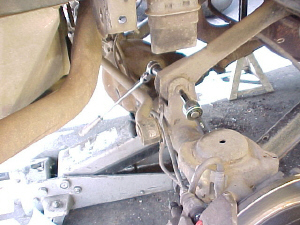 The upper rear arms weren’t the same length. I know this was an accident but it meant a little slice and dice was needed to get them to work (arrow). 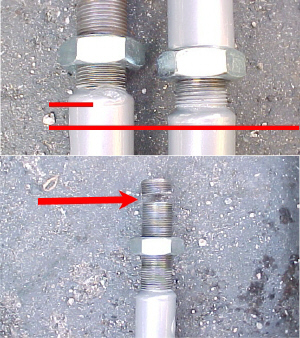 The upper picture shows that the tube on the left arm is 1/2″ longer than the one on the right. The threads were bottoming out in the tube so we couldn’t get the arm short enough to work right. After cutting that extra 1/2″ off the threads we were back in business and ready finish up. Install three of the new arms (see below) but leave them finger tight until you get the weight back on the tires. Snafu number 2. We’re starting to have a bad day! Let me just say that this was going so well until a few minutes ago. We installed all the arms in the rear and then did the track bar relocation bracket. WRONG! Do not install the arm that attaches to that point. You’ll need to have access behind the arm. Second, we didn’t have a T55 Torx socket and couldn’t find one when we needed it. Third, the new bolt that is supplied with the kit did not fit our trackbar. We tried to drill it out the sleeve but it’s hardened and there’s just no chance of that happening in this lifetime! We got a new 1/2″ grade 8 bolt to fit. All these would be OK if we were prepared for them and could take care of it all at once. Make sure you have the T55 socket before you start. It’s very important. With that bracket cinched down and the last control arm installed you can put the springs in. 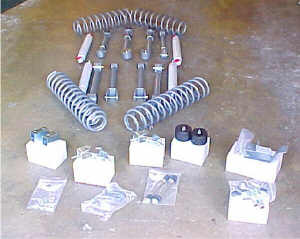 Install the shocks now and the bumpstop extensions. Get the new extended swaybar links in place but you can’t tighten them down until you have the tires back on the ground. Add that to the list of things to do before you drive the Jeep. It’s time to finish up with this project. Put the tires back on it and set it back on the ground. You’ll need to tighten all the arms up now and you can tighten up the rear swaybar too. Make sure the trackbars are on tight and double check everything. 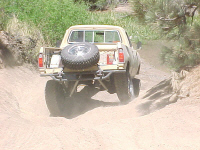 The front trackbar needs to be adjusted to center the axle under the Jeep. 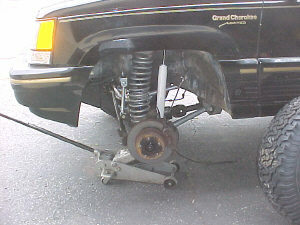 Measure each tire at the fenders to see if they are too far in or out and move the rod end accordingly. Tighten that up and it’s time to check to toe-in of the front tires. Take a tape measure and measure the distance between the rear of the tires. Now measure the distance between the front. 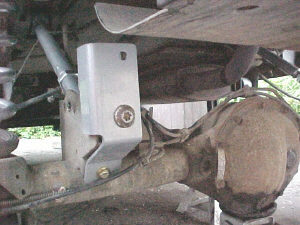 The front should be about even (+- 1/8″) to the rear. Ours were 1 1/2″ in! That won’t even get you around the block, we know we tried it! The reason they are out of alignment so badly is the steering is now at a much steeper angle. Just loosen the two nuts on the tie-rod sleeve near the driver side tire. Crank it until you get the front and rear of the tires about the same distance apart. That will get you to the alignment shop. The other thing you’re going to want to check is rear pinion angle. Ours needed to be raised just a little to make it perfect. Simply remove one end of each upper or lower arm and turn it in a bit. A little goes a long way here. When you’re done tighten up the jam nuts and that’s it. With this suspension Rubicon says you can run 31, 32 or 33″ tires. Being that the sickness runs deep with us we want (read: NEED) 33’s! That ain’t gonna be easy, let’s just get that out of the way right now. This Jeep has so much flex that the tires really move! We took a set of 33×13.50LT15 Mickey Thompson bias-ply Baja Claws off our Wrangler to see how things fit. First thing you need to do, lose all the plastic wheel well liners! Better here than on the trails. In the front we had to trim the inside in the fenders quite a bit. The front bumper, hack city! From the outside it looks like stock. We found that the problems aren’t with the outer parts of the front fenders but with the body seams and lower inside lip. A little slice and dice then a good smack with a sledge hammer will do the trick. We had to carve up the front bumper quite a bit. Again, leaving the outer portion alone we went to work just to the inside of it and remove about 2″. The allows plenty of clearance and looks like stock. Can’t beat that! For the rear, the stock bumper has got to go! It’s hitting big time. We’ll be doing some major work back here but it’s only temporary. New bumpers are in the works for this baby. 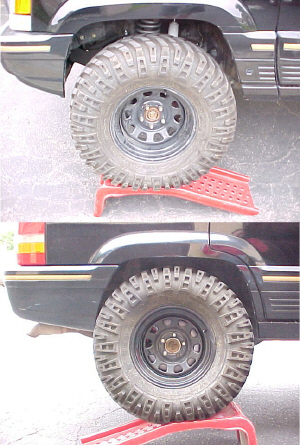 If you aren’t up to hacking into your Grand Cherokee then you might just want to go with 32″ tires, although I can’t see them fitting without at least a little trimming. After our first real drive we found out one important thing. Follow the directions, all of them. Rubicon Express does not recommend the use of bias ply tires on this vehicle. 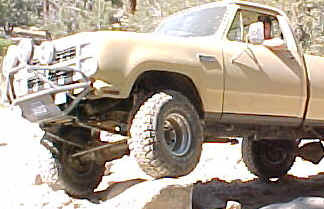 The Mickey Thompson Baja Claws we installed to test it were. That didn’t work at all. We had death wobble up the ying-yang! Swapping those out for a nice set of 33×12.50R15 BFGoodrich All-Terrain K/O’s on 15×8 Mickey Thompson Classic II wheels made a huge difference. We also replaced all the steering linkage as it was worn and not helping us any. This made our Grand drive like a million bucks. A few more slight alteration on the fenders will open up a lot more room for us and we hope to get it up on the trails for some serious testing soon. What do we think of the lift so far? It’s the best I’ve ever seen. This thing is amazing. Other than the small problem with the lower rear arms being the wrong length I’d say the folks at Rubicon Express have done their homework. 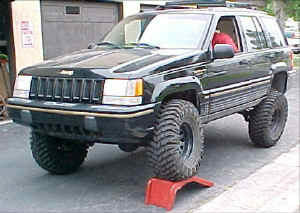 If you are looking at taking your Grand Cherokee to new heights, you really must give them a call.